The Dell Inspiron 1750 is a large, comfortable laptop that offers plenty of performance and, considering its size, portability. The keyboard isn't very competitive, however, and we have some issues with its poor build quality. The 17.3-inch screen is great. The 1600 x 900-pixel resolution is extremely sharp and images are satisfyingly detailed, making photos and films look great. You can comfortably work with multiple windows open, but the shiny Super-TFT screen coating frequently attracts distracting reflections. Build quality is disappointing, with the chassis panels flexing under minor pressure. 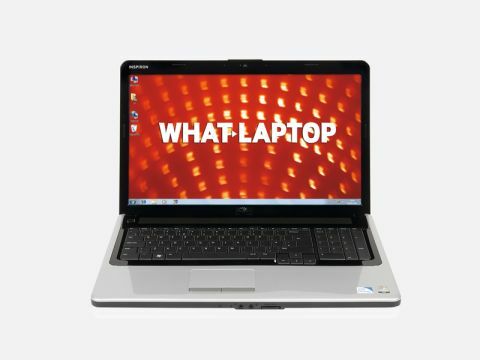 This reduces durability and we can't see this laptop surviving much of a drop. This has a direct effect on usability, and the keyboard is one of the spongier options. The keys are nicely spread out, but the action is quite clunky and it's hard to strike up a good rhythm.The dedicated pad of numerical keys will suit those who regularly use spreadsheets and input data, however. A dual-core Intel Pentium processor is in place, alongside 4096MB of DDR2 memory. This allows the machine to be suitably powerful during everyday use and we found no issues in running multiple office applications concurrently without any noticeable drop in performance. More resource-intensive programs, such as digital photo editing suites, will also run smoothly, but the integrated Intel GPU strongly hinders more demanding multimedia use, with only the most basic gaming or video editing possible. The 320GB hard drive isn't the most capacious, but provides plenty of space for storing thousands of files, photos and movies. The DVD rewriter lets you write and read DVDs without issue. Considering this laptop's size, portability is decent and the 250-minute battery life impressed us. At 3.1kg, the machine isn't light, but you could certainly carry it around on short trips without issue. 802.11n Wi-Fi provides the fastest wireless technology, while 10/100 Ethernet allows you to set up and connect to wired networks with average speed at home or in the office. The inclusion of three USB ports isn't particularly generous on a chassis of this size and there's no high-definition HDMI port, but an older VGA port is in place and makes it easy to connect to external analogue monitors. Despite its durability and keyboard issues, the Inspiron 1750 is a comfortable desktop replacement that provides decent performance at a competitive price. Those after a little more should check out the Acer Aspire 7736G-663G25Mn, however.